1.Cream the butter and sugar until soft about 3 to 5 minutes. Add in the vanilla. Add in the eggs one at a time and mix until each is incorporated. 3.Add the flour mixture and the sour cream alternately to the egg-butter mixture in the additions. Start with the flour and end with the flour. Scrape the bowl occasionally. 4. Using an ice cream scoop, scoop out muffin batter one at a time and drop into a shallow bowl filled with the cinnamon sugar mixture. 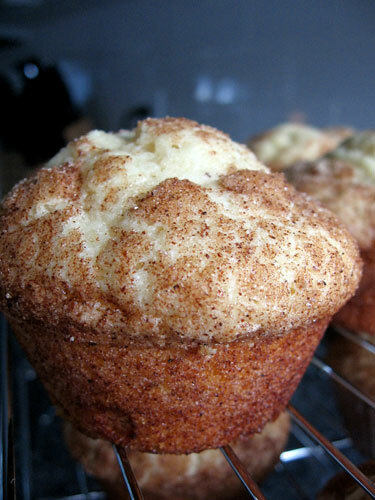 Roll the muffin around in the mixture until it is covered completely in cinnamon sugar. Place muffin into muffin tin. Depending on the size of your tins, you should get about 12 to 14 muffins. Bake them for approx. 20-22 minutes in a 350F oven or until they are golden brown.